Several years ago, I forget how many, I cut out (well, mostly cut out) a quilt using this pattern from Quilter's Newsletter, January/February 2001. At the top of the page it says it is an intermediate pattern. It looks more advanced to me. Lately, this unmade quilt, residing in an under bed plastic storage container, has been giving me very dirty looks, implying I should finish her. (Somehow I think of quilts as feminine, don't you?) While it may look rather messy, this is actually fairly well organized. I have each set of pieces in a plastic bag with a note that says how many pieces are needed and cut, along with some extras. As you can see in the magazine, this quilt is full of triangles which are a challenge to sew. Extras are always needed to replace all the poorly sewn pieces, of which I seem to have far too many. These are the two blocks I'm working on right now. The Rising Star block on the left is completed, with all 20 made and trimmed. Not all of them have that slightly wonky four patch in the center. I need ten more of the star blocks on the right, with six of them getting larger Flying Geese to make an even bigger block. Then I have to make them in the reverse colors. This will take quite a while! Piecing away! I found that most of the pieces that I had sewn years ago are so sloppy as to be unusable, so I'm redoing almost all of them. Over the years I have become much fussier in my work, which I think is a good thing. Luckily I have so much fabric I don't need to buy any more. I'm sure I also have enough for a backing. The pieces shown above are starched very well, which helps to keep the fabric from stretching while stitching. I didn't starch the pieces years ago when I started this quilt, and I'm sure it contributed to the poor piecing. This quilt measures 76 1/2 inches by 93 1/2 inches, which will cover a queen sized bed. However, my bed has an extra high mattress, so I will have to make this wider. I can either add another border (easiest option) or add another two vertical rows, which will make it 93 1/2 by 93 1/2. As a rule, I like to make interesting borders, so I'll have to think about it. Luckily, I have plenty of time. I hope to get quite a bit done today. We have plumbers coming in to fix a leak in the pipes which completely destroyed our new hardwood flooring in the living room. The floor hadn't even been in for two months. Oh well, it's only money, not something actually serious. This last October Mr. CS and I met our son from Connecticut and visited Washington, DC. Mr. CS especially wanted to see the Smithsonian museums, as he had never visited our nation's capital. Wait, you say, wasn't that during the government shutdown? Right you are! 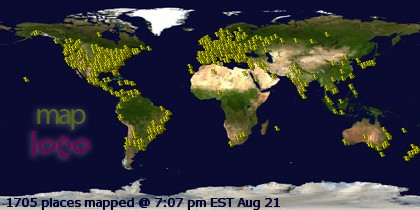 This was certainly an ill-timed visit. Luckily, there were several very interesting places that were still open. 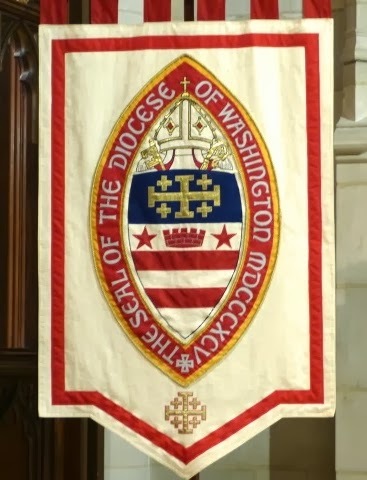 One of which was Washington National Cathedral, which has quite a bit of very lovely embroideries. In this post I'll show you the photos we took of the various banners. We couldn't get up too close to them, and I don't have any information as to fabrics, threads, techniques, etc. The ground fabrics do seem to be silk, judging from the sheen and general, well, "silkiness" of the fabric. There is definitely some appliqué and certainly a fair bit of gold work. This is the poorest shot and was taken from furthest away from the actual banner. 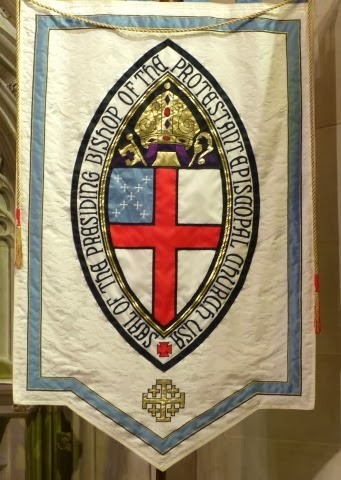 But I love the gold work, and the complicated cross that is on the bottom portion of all the banners. I'm sure there is a name to it and the significance is explained somewhere, and I'll look it up and share it with you. Some of you may know, so if you do, please drop me a line. At this point I would like to draw your attention to the blog written by Ruth O'Leary of Ruth O'Leary Textile Arts. 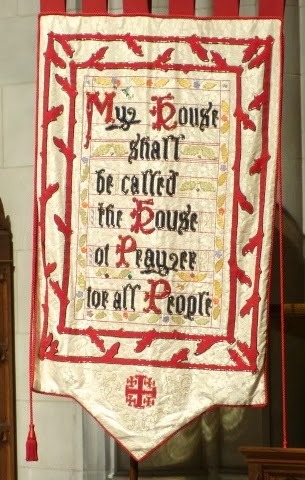 Back in early 2012, Ruth completed work on a commissioned piece, St. Cuthbert's Banner for the Durham Cathedral in Durham, UK. If you click on this link you will see St. Cuthbert's Banner in the upper left hand corner of the photograph. Now she is working on another banner, this time for the Druids! Ruth does lovely gold work, appliqué and general embroidery, and I encourage you to visit her site by clicking on this link. 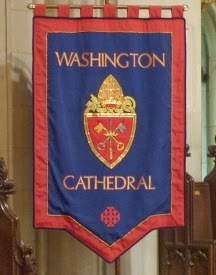 Washington National Cathedral is open most days to visitors, although not today as they are expecting a snowstorm in the area. They even have a needlework Tour and Tea, which showcases all the needlework pieces on display. Virtually all of the seats have needlework cushions, and I'll show you some of those in an upcoming post. I just completed a Craftsy class, Classic Tailored Shirt, with Pam Howard as the teacher. This was my first class, and I must say I'm pleased, mostly, but I'll explain more later. This is a shot of the finished shirt. Normally I blog as I progress through the project, but I was so into this that I just kept forgetting. The fabric is a white poly cotton, 65/45 that is an Oxford style fabric. This is fine for a wearable muslin, which is what this shirt is, but not much else. I also used a 100% cotton woven fusible Pellon interfacing, SF101 Shapeflex, for the collar, collar band, cuffs and front bands. DO NOT USE THIS STUFF! It bubbled after the first wash. I was able to iron it smooth again, but this is not a good thing. The shirt is for my son, who has some severe fitting problems. He has a 18 3/4 inch neck but a 45 inch chest. So if he buys a shirt that fits him in the neck it's like a tent on him. With Pam's advice, I grafted the size 52 chest collar and collar band to the size 46 yoke and front. I didn't get the pattern dots quite right, but it did work and the shirt fits reasonably well. I used Simplicity 1544, not the recommended Kwick Sew 3555, but only because KS 3555 is a women's pattern and I didn't want to have to order the men's pattern again. So off I went to Joann's to buy the Simplicity. They didn't have the KS. Don't worry, I didn't pay that price, I got it in the 5/$5.00 sale. Once you start actually looking at shirts you'll be amazed at the differences in them. I used a square pocket instead of one with a point, as on the recommended pattern. This shirt also had a separate band for both fronts. The KS pattern folds over for both fronts. I looked at my husband's shirts and found that while most have separate bands, many have a separate band for only the buttonholes, and have a fold over band for the buttons. A few have fold over bands for both. The Simplicity pattern also had a tower sleeve packet, which you can see in the first picture. The KS pattern has a continuous bias strip for the placket, which I think is fine for children's clothes or maybe adult back neckline openings, but not in a tailored shirt. All the seams are flat felled, which turned out to be much easier than I thought. The hem was super easy. Forget about the instructions in the patterns, which have you fold up the raw edge twice and sew, and it always seems to look sloppy. The course instructions have you sew a guideline 5/8 inch away from the hem (using a long stitch length), fold and press on the stitching line, then tuck under the raw edge with your fingers right at the machine and sew it down. You could press it first, but I found I didn't need to. Then remove the guideline, and it's a perfect hem. I didn't use a rolled hem foot as the one I have is much too small for this particular fabric. I received this book for Christmas in 2012 and it has so much great information about shirtmaking. I'll be using this for inspiration and techniques as I make more shirts. As I mentioned, I was going through my husband's shirts and found a few things to show you. Here are two tower plackets, one pointed and the other squared off. But look at how badly they are matched. Now, these are just department store shirts from Macy's, not at all pricey, but really, couldn't they have a bit of quality control? This shirt pocket doesn't even match to the shirt. This pocket matched, but it could have been centered with the stripes better. But that's one of the reasons we sew, to make our garments look good! So what's next? My son requested a few alterations to this shirt. I had to make the sleeves and cuffs much narrower, but I did that while fitting, so now the cuffs fit perfectly. The sleeves are a bit too long, and the torso a bit too short. I'll make those changes in the next shirt. He is pleased that he now has a shirt that actually fits both in the neck and chest. But first, I may make a shirt for my other son, the one in Connecticut, who, now having graduated, is starting to need dress shirts. His fitting problem is that he is fairly small, so has a very hard time finding shirts that are small enough for him. Soon several of us will be driving to the LA garment district, where I hope to find some good shirting fabrics, with buttons to match. And some decent interfacing. I have German interfacing which always works beautifully, but it isn't stiff enough for what my son wants. I mentioned a problem with the Craftsy class. What is happening is that the text boxes on the screen have increased in size, while the video portion is very small. If you set it to full screen it works, but then you can't see the comments or scroll through the various portions of the class. I've written to them, so we'll see. It looks to me like the platform just isn't very robust. I'm definitely developing a love/hate relationship with the Celtic Hearts Blanket. Remember how I ran out of several of the threads, and ordered more just to finish the project and to make some additions? Well, look at the above photo. The Colourstreams Exotic Lights that I ordered is substantially different from what came in the kit over four years ago. The new threads, on the right, are very much less shiny than the original. Which means I can't just substitute the new threads in the embroidery. This is a shot of the buds made with the original Exotic Lights, with the needle pointing to one made of the new threads. Completely different! The original Exotic Lights is bright and shiny, the new version is dull and flat looking. See the empty green stems? They need buds, and I'm completely out of the original threads. I need about seven or eight buds to finish the design. As it turns out, I made two sets of the spider web roses using the original Exotic Lights. There are four sets on the blanket so I decided to try the roses using the new threads. This photo is of the original roses. It's acceptable. Not great, but acceptable. Which means I can carefully cut out the roses with the original threads and use them for the rest of the buds. Out of each rose that I cut out, I can get three or four buds from the strand of thread. With the buds are completed, and I'm adding the leaves with silk ribbon.This leaves me with a dilemma. I purchased the extra Exotic Lights with the intent of adding a single heart to each corner. The hearts would be embroidered in a chain stitch using the DMC Wool, then adding the double Pekinese interlacing with the Exotic Lights. But with this newer, non shiny threads, the hearts would look substantially different than the center embroidery. And I know I won't like it. Maybe I'll add a set of spider roses to each corner, with some green stems, buds and leaves. I'll have enough of the original Exotic Lights for at least two buds in each corner. I'll have to think on it for a bit, and please, any suggestions you may have will be welcome! Oscar is modeling for me on the completed Yale colored afghan. I started this way back in early 2011 even though I didn't post about it until May. That means it has taken just about three years to complete. It's a fairly large afghan as my son has a queen sized bed. Each square is eight inches, with the afghan containing 12 by 8 squares with 1 1/2 inches of border, for a final size of 99 by 67 inches. I made a simple shell edge for the border, the original was much more open and frilly. I like the denser design better. It's all packaged and awaiting a trip to the post office. Since it is still winter he will get a few more months out of it before it needs to be packed away for the summer. For the information on yarn, colors, etc., please click here for my first post on this afghan. It feels so good to get something finished, even if it did take three years! The guys I live with went out hiking today in Anza, which is somewhere east of San Diego. I have the whole house to myself for several hours, and I plan to make the most of it. I'll closet myself with the Celtic Hearts Blanket, and will post on that in a day or so. I didn't make any New Year's resolutions, but I am trying to not buy any new fabric or kits that I don't need. Instead, I am trying to finish what I have and clean out some of my stash. I started this Blue and White Crocheted Afghan over three years ago, and have made up my mind to finish it as soon as possible. The squares have been sitting in the family room and my son even made some into a bed for the cat. That made me want to put it together and get it out of the house! This afghan is destined for my youngest son, who just finished his PhD in Physics from Yale early last year. The blue is close, but not quite "Yale Blue", but not a bad match. If you follow the above link you'll see I posted on this in May, 2011, which is a terribly long time ago. I've put all the squares together and am furiously working on the edging. Here I'm on the third row which is now over half way complete. I got quite a bit of work done on it while watching Downton Abbey last night. It helped that it was a two hour show! Only one more row, a scalloped edge, then a quick wash to get out the cat hairs and off it goes. Only now, since I took away the cat's bed, I am being compelled to make something for him. I have a few odds and ends of yarn so we'll see. Today is my semi-official start to the New Year. Yes, I know I'm a bit late, but during the past several years I've been waiting until the youngest goes back to Connecticut to start putting away Christmas decorations and otherwise really get going. We put him on a plane yesterday (sniff) so now, at least for me, the New Year is starting. What will I be doing, stitching wise, in 2014? I have a whole list of projects that I put together and will be posting them along with photos in the "Ongoing Projects and Finishes" page of the blog. It's a pretty ambitious list and I hope that putting them all out there for everyone to see will keep me motivated to work on and actually finish them. I've also updated my Reading/Listening and About Me pages, if you're interested. To all of you in the Midwest and Northeast: Keep Warm and stay in! Our high will be 77 F, which is just wrong in January. We are in the third year of a drought, and the temps aren't helping. Happy New Year to all of you and I hope that you can find some time each week to work on your stitching! 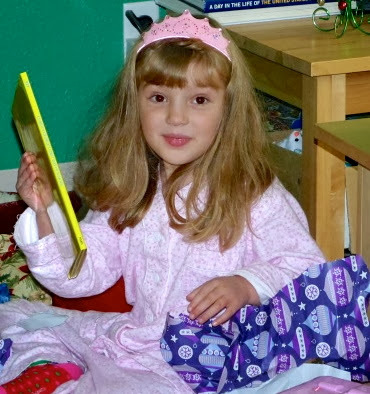 My granddaughter loved her new pink PJ's, which I described in the last post. These weren't a Christmas present, so when we neared my daughter's house in Colorado last week I put the them on the top of my tote bag and brought them into the house. After an hour or so she saw them and immediately recognize the fabric that she had picked out and was thrilled to wear them. Note the matching tiara which was in her Christmas stocking. 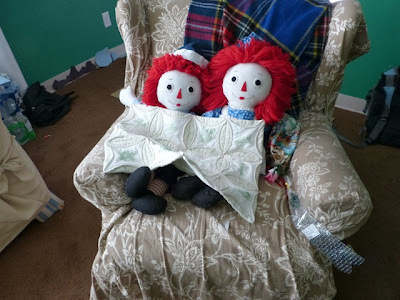 Raggedy Ann and Andy are sitting together with the little doll's quilt I made. I didn't write about the quilt since it was such a rush job. Each block has a redwork machine embroidery design (done in green to match the back fabric, which is a green toile). The blocks were circles and made into Cathedral windows. I hope everyone had a wonderful Christmas and I wish Happy New Year to all of you! I hope to make some lists of projects to finish and new ones to start and will post that as soon as I get my head around them. Monica from Lakeview Stitching had a great idea of having WIP and Finishes pages on her blog, and I may do that as well. Maybe it will keep me more focused in the coming year. I certainly need it. One change that I'll make is that I'll post a new photo of myself. The cat has been gone for three years, and I look fairly different, having let all my grey hair grow out. No stitching for me today, I'm making pumpkin ravioli for New Year's dinner.